Wintermute has been kind enough to open source the DSi hack we have been using. To run the hack you will need a way to read and write save files on DS carts. 2) Edit the asm source file to reflect your region (US and UK currently supported), and of course add your own custom code. 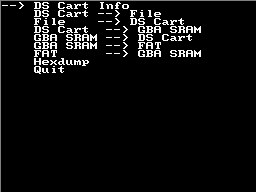 4) Load the save file onto the game cart. Currently you are limited in space which restricts you to assembly programming. Hopefully this will inspire a few more people to poke about and get info coming in on SD card access and, of course, the cameras. I have been using a tool called eepinator to upload the save file using a regular DS. There are probably other tools which would work. This is a basic EEPROM backup tool. Basically it lets you copy the save-games from your commercial game carts back and forth to your flashcart. It also supports using SRAM as storage, and if you have a gba cart in slot-2, and a flashcart in slot-1, you could copy the sram off the gba cart to your flashcart. Hexdump is not implemented yet. It uploads your saves via WIFI to your pc, eliminating the problem slot-1 flashcard from the equation!